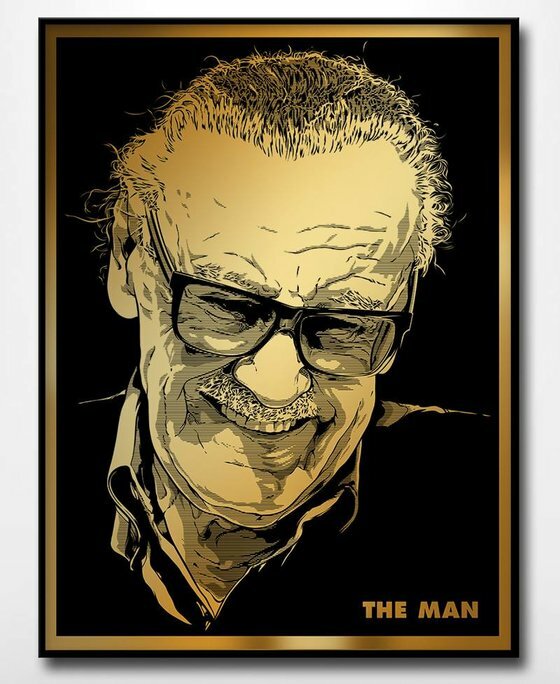 Artists and Writers sure do love their Stan Lee. The beloved Comic creator, responsible for most of the best characters in fandom, passed away yesterday - and you probably couldn't help but notice due to the out-pouring of respect and love from around the world. This tribute just popped up inside the hour and I wanted you to know about it. One of my favorite pop culture artists, Josh Budich, appeared on my Outlaw Roadshow radio program about two years ago and we dissected his influences then. Josh has created an ultra-rare gold foil tribute, an 18x24" poster, (limited to just 100 copies) that is now on sale via Nakatomi. Half of all the proceeds to to The Hero Initiative- a charity that helps comic book creators in need. That is kind and cool all at once!